Summertime has so many great things to offer. Swimming, lazy days (if you are a kid that is! ), longer evening sunsets and most of all the fresh, crazy bountiful produce at your market, farmers market, or in your backyard! Every day for the past few days I have wandered out to my garden and pulled some fresh, red, ripe tomatoes off the vines. This year I have Roma and a few varieties of cherry tomatoes growing alongside some herbs and cucumbers. My neighbors and family have always been generous with the standard tomato varieties so I did not get crazy with growing those this year. But if there is one thing tomatoes do is that they produce! My vines, my family and friends vines give and give until I am sitting with piles of tomatoes and no way to eat them all before they go bad! When I have made all the fresh tomato recipes I can (try this one for Tomato Mozzarella Bread if you have not it is AMAZING!!) I remove the skins and freeze the bounty to be used when the cold winter days call for nothing less than the heartiest of sauces and casseroles. It also gives me just a little taste of summer which helps to remind me that the cold will pass and I should embrace all of the seasons even when I can’t feel my fingers! 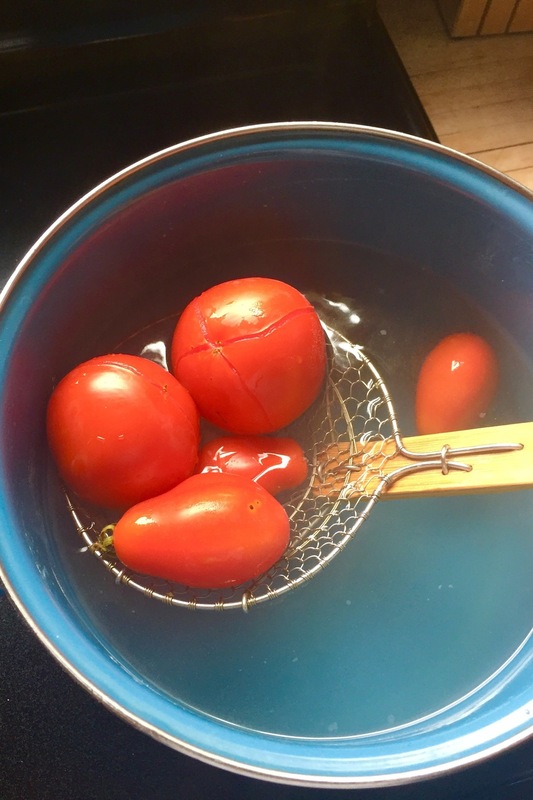 There are so many preservation methods out there, but I like to freeze because it is simple and only takes a bit of time to fill my freezer with yummy tomatoes to use all fall and winter long. Below yo will find details on how to remove the skin from the tomato (a MUST do before you freeze!) which you can then freeze or use that day if you wish to make salsa or sauce without the tomato skins. If you are feeling “saucy” you can try fresh tomatoes in my Simply Tasty Pasta Sauce. When freezing tomatoes please note that the consistency will change and they are best used in sauces, casseroles and dishes where they are cooked. So sorry no winter salads with summer tomatoes! If you make the Simply Tasty Pasta Sauce from fresh tomatoes you will need to add about 1-2 tablespoons of tomato paste and allow it a bit more time to simmer to your desired thickness. The tomatoes will keep in the freezer for 3-6 months but will change texture a bit which is why they are amazing cooked but not so great eaten raw! 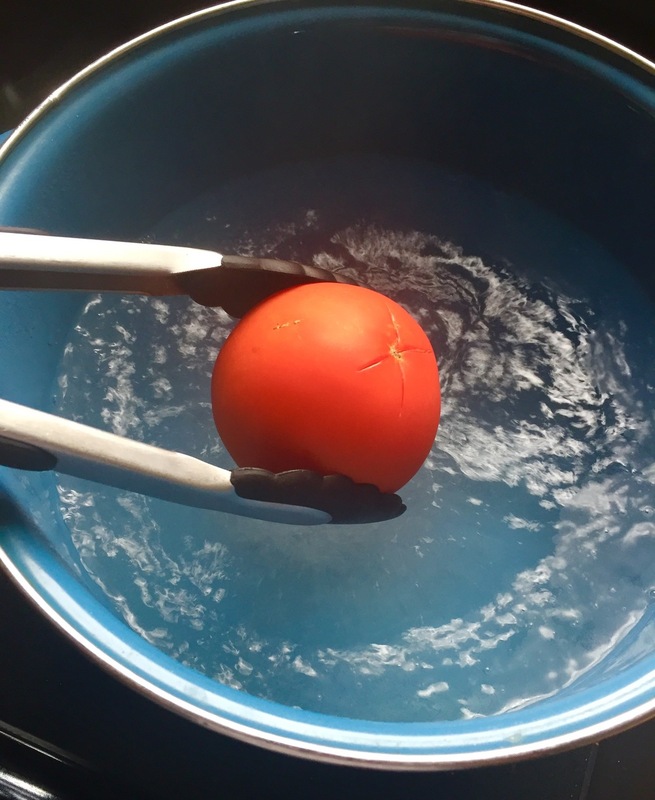 While the water is coming to a boil, clean all tomatoes and make a small X on the bottom of each one. Right before the tomatoes are added to the boiling water, fill a large bowl with ice and cold water. Leave tomatoes in water for 30-35 seconds, then remove and immediately submerge all tomatoes in large bowl of ice water. Using the X made on the bottom, peel off the skin of each tomato and chop/dice all tomatoes per your preference. If you are using the tomatoes for a recipe continue with recipe. If you are freezing, divide tomatoes into portions and add to freezer bag or container. Put all tomatoes to be frozen in the refrigerator for at least 4 hours before freezing. This ensures they are fully cooled and will be less likely to grow icicles while in your freezer! Now you have fresh summer tomatoes to enjoy during the long freeze, were able to save your bounty because tomato plants really produce and learned something new with only a bit of time used. Enjoy!